If you haven’t been in Eugene for a few years and approach campus from the east along Franklin Boulevard, you might be surprised by what you see. Three new buildings have transformed what used to be an ugly jumble of parking lots, chain-link fences, and dilapidated retail space into a gleaming campus gateway. The Matthew Knight Arena dominates the skyline. Construction of the $227 million, 12,500-seat arena began in early 2009 and the doors first opened for a men’s basketball game against USC in January. The arena is the setting for UO men’s and women’s basketball games, volleyball matches, and a variety of other university-related events, as well as concerts, lectures, and other gatherings. 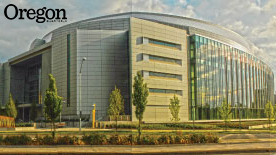 Adjacent to the arena is the four-story, $33.6 million Cheryl Ramberg Ford and Allyn Ford Alumni Center. Opened in June, it houses the University of Oregon Foundation and the University’s Alumni Association, student orientation services, and development department. The 60,000-square-foot facility is the first place prospective students visit when they arrive for a campus tour. It also provides a welcoming starting place for returning alumni. A 2,000-square-foot interpretive center includes an interactive multi-media installation that celebrates UO heritage and history and informs visitors about current and upcoming events. In January 2010, the glass-faced John E. Jaqua Academic Center for Student Athletes began providing UO student athletes a place to gather as a community focused on study and learning. The Jaqua Center includes ninety-two rooms, with assigned study carrels, library, lounges, and nearly 700 computers. The 40,000-square-foot structure is also available for general student use, with class and meeting spaces, tutoring rooms, and a coffee shop.